For the past year I have been working on a series of Paper Quilts. 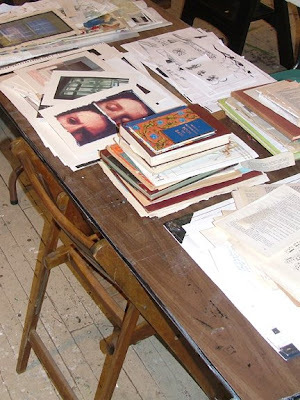 They are combinations of my original photographs, found photos, and collected paper ephemera that has been discarded, previously used, or damaged. 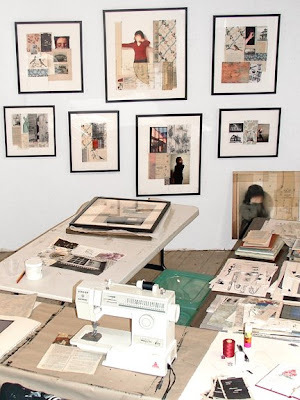 The pieces are stitched together using a traditional sewing machine in the same way that one would sew a 'crazy quilt' made with salvaged scraps of fabric. Utilizing misplaced and fragmented elements from life in my art has always been important to me and central in my work. Each Paper Quilt reassembles once disparate parts into a new whole, creating a reinvigorated narrative. I will be showing many of these quilts at the upcoming Beacon Hill Art Walk on Sunday, June 1st. Hope to see you there! What a cool idea. My wife is a traditional quilter and would love to see your work too. Do you have any more pics of the photo-quilts? Thanks Jim! Yes, you can see more of my paper quilts on my web site (http://www.jessicaburko.com/FANewWorkPage.html) the top two rows of pics are paper quilts, and I also have images in my Flickr account (http://www.flickr.com/photos/jessicaburko/sets/72157602083922243/). I appreciate your interest! i love these! and i'm so happy to see a pic of your workspace. it is inspiring! thanks so much for sharing your work with us!